We've now come to the Series Five, the final series of short stories (apart from Labours of Hercules, which will be included in Series Thirteen). This series opener was based on the short story 'The Adventure of the Egyptian Tomb', first published in 1923. The story was adapted for television by Clive Exton and directed by Peter Barber-Fleming. Exton stays largely faithful to the short story, with certain expansions, additions and changes. First, there's the inclusion of newsreel footage (by now a near constant in these adaptations) from the opening of the tomb, the opening of the tomb itself and the death of Sir Willard (he dies almost instantaneously after the opening here, suggesting the supernatural theories more clearly). Second, there's the fact that Hastings visits Bleibner's nephew in New York (Hastings has apparently been on a holiday / business trip to California). He sails back on the Queen Mary, a nice reference to 'The Million Dollar Bond Robbery'. Third, Lady Willard's consultation is split in two, one before the deaths of the other expedition members and one after these. Fourth, Miss Lemon is added (and she's interested in both tarot cards and seances (a reference to Peril at End House), apparently because her cat called Catherine the Great has recently died (!)). Fifth, the rivalry between the British Museum and the Metropolitan Museum is somewhat expanded. Sixth, Dr. Ames doesn't commit suicide but instead attempts to make a run for it (yes, I know, that seems to be a constant fixture in Exton's adaptations, probably to add some more excitement or something...). Finally, Exton adds a sensible explanation of Rupert Bleibner's will to the denouement, and Miss Lemon gets a cat from King Men-he-Rah's tomb. All the changes make more or less sense, and the end result is good. Barber-Fleming's direction emphasises the Egyptian theme with several close-ups of sarcophagus masks and mythological objects. It works reasonably well, and underlines the location nicely. The scenes in 'Egypt' were probably shot on location in Spain. The soundtrack for the episode is not included on any of Gunning's releases, but bits of it seem to be taken from the score of 'The Affair at the Victory Ball', which has been released. It's nice to see the continued expansion of Miss Lemon's character (even if its far away from the character that Christie wrote!). Also, I was delighted to notice that Poirot's clothes' brush (mentioned in the short story) is actually seen on screen for a few brief seconds - and that Poirot's obvious discomfort of being in a desert is underlined (like in later episodes set in the Middle East). As to guest actors, there are no stand outs really, but they all portray their characters accurately. 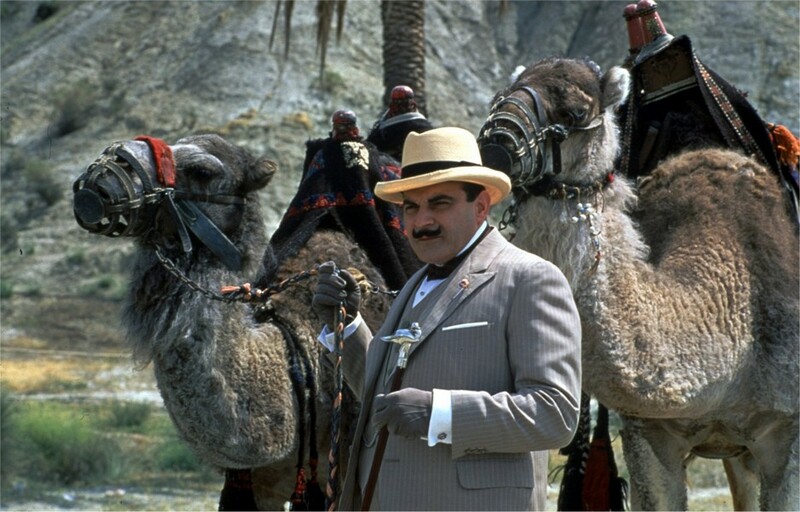 In "Poirot and Me" Suchet admits to collapsing from heat while filming this! Elsewhere he says he "almost seemed to catch whatever illness Poirot was supposed to have!" Now, Poirot doesn't really collapse in this one. but the collapse seems in keeping with the troubles he has with the elements and physical exertion. Hi, I'm a fan of Art Deco houses myself and I also got curious about the one they used on this episode. After a little bit of research, I believe I found the house where they shot it (at least for the exteriors): White Gables in Gerrards Cross - in Buckinghamshire.